Highly Active Antiretroviral Therapy (HAART) has significantly contributed to the increase of HIV-infected survivors over 50 years of age. Unfortunately, patients are required to stay on long-term HAART, which may be causally related to the development of neurological problems such as chronic pain. Little is known about the contribution of HAART or its therapeutic agents to the pathogenesis of pain during aging. In this study, we determined the effect of nucleoside reverse transcriptase inhibitors (NRTIs) on the development of mechanical allodynia and the potential underlying mechanism in aging mice (15.5 months). We found that systemic administration of individual NRTIs, including ddC (2′-3′-dideoxycytidine), ddI (didanosine), AZT (3′-azido-3′-deoxythymidine) and d4T (2′, 3′-didehydro-2′, 3′-dideoxythymidine), induced allodynia in similar magnitudes and temporal profiles. We used ddC as a representative to investigate cellular and molecular processes induced by NRTIs in the spinal cord that probably underlie the development of allodynia. The results showed that ddC caused evident neuroinflammation in the spinal cord, suggested by the up-regulation of proinflammatory cytokines TNF-α and IL-1β and the reactions of microglia and astrocytes. In addition, we found that Wnt5a, a critical regulator of neuroinflammation, was also up-regulated. 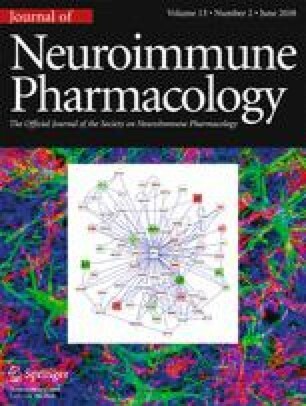 Pharmacological inhibition of Wnt5a blocked ddC-induced up-regulation of TNF-α and astrocyte reaction, while activation of Wnt5a signaling potentiated these processes. Furthermore, our data showed that inhibition of Wnt5a significantly reversed ddC-induced mechanical allodynia in aging mice. The results collectively suggest that NRTIs may contribute to the development of chronic pain in aging patients by inducing Wnt5a-regulated neuroinflammation. This work was supported by NIH grants to SJT: R01NS079166, R01DA036165 and R01NS095747.